In 1995 with the acension of New Zealand to the Security Council of the United Nations the New Zealand Government soon found itself under obligation to send a peace-keeping contingent to Bosnia. The basic force was to consist of a rifle company backed up in part by troops from Queen Alexandra's Mounted Rifles. A total of 26 APCs were sent consisting of 20 M113A1 APCs, two M125A1 Mortar Carriers, two M579 Fitters Vehicles, one M806 Recovery Vehicle and one M113A1 Ambulance Vehicle. The carriers all underwent modification prior to departure which included the fitting of extra armour in the form of the Enhanced Applique Armour Kit (EAAK) from FMC Corporation. After a tour of duty lasting a year the carriers were returned, the EAAK armour removed, the mounting bolts for the armour removed from the vehicles and returned to normal duties in New Zealand. Then in 1999 the country was called upon again to provide troops to quell the trouble in East Timor. This time a larger force was promised again backed up by carriers from QAMR. So the EAAK armour was dusted off new attachment points added to the vehicles and the force despatched. It is likely to be there until early 2000 when the UN takes over. This is the reference vehicle for the M113A1 conversion which was kept at Trentham Camp. In addition to the EAAK armour the vehicle was fitted with wire cutters on both sides of the hull, a spotlight and sabre image intensification sight on the turret and internally with spall liners. A standard M113A1 of Queen Alexandra's Mounted Rifles on check point duty in Bosnia. An M113A1 Ambulance vehicle at Waiouru prior to despatch to East Timor. 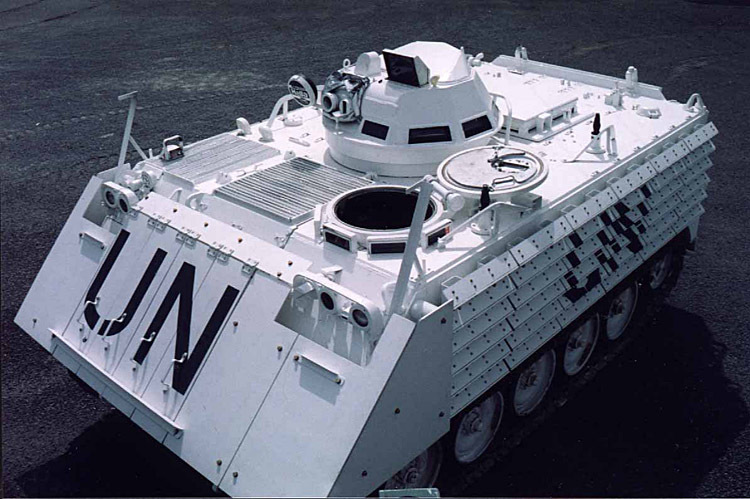 All vehicles not equipped with the T50 turret were fitted with cupola and gun shields. After Bosnia the Army decided to replace the standard bronze green finish of their vehicles to tan because they found that it took several coats of white paint to completely obscure this colour. Unfortunately repainting a M113A1 is not a simple matter as the vehicle needs to be completely degreased first and this is only done after a complete overhaul. Hence the composite colours of the vehicle - the standard MERDC Red Desert Scheme underneath the tan finish of the EAAK armour. The rear of the M113A1 Mortar carrier showing the stretcher kit from a Unimog Ambulance in place. These vehicles were converted from ex-Saladin turreted FSVs from the Australian Army. To cover the hole left by the turret, a plate was bolted over the rear part of the roof of the fighting compartment.